Time and space, creating passing and shooting lanes – these are all challenges in today’s game. 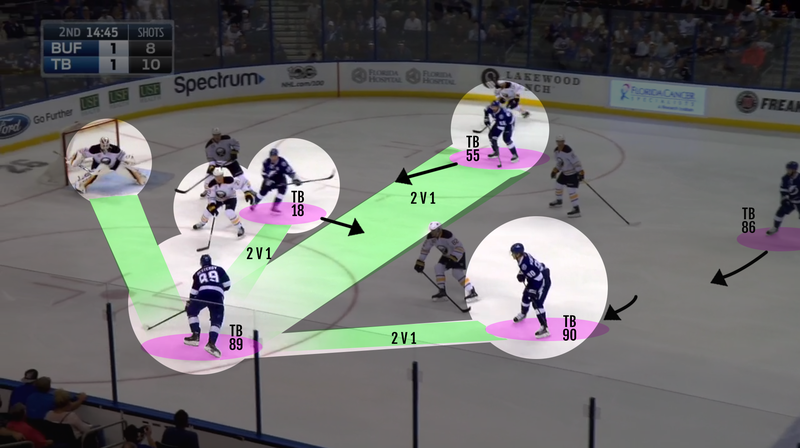 In this edition of Video Coach, we look at rotation of players in the offensive zone the concept of TOTAL hockey – where all five players are in sync, read off each other and are interchangeable positionally – to manipulate defenders and create confusion. The puck is rimmed up the wall where defenceman TBL55 successfully pinches down and keeps puck in the zone. TBL90’s positioning allows TBL55 to pinch down the wall immediately. 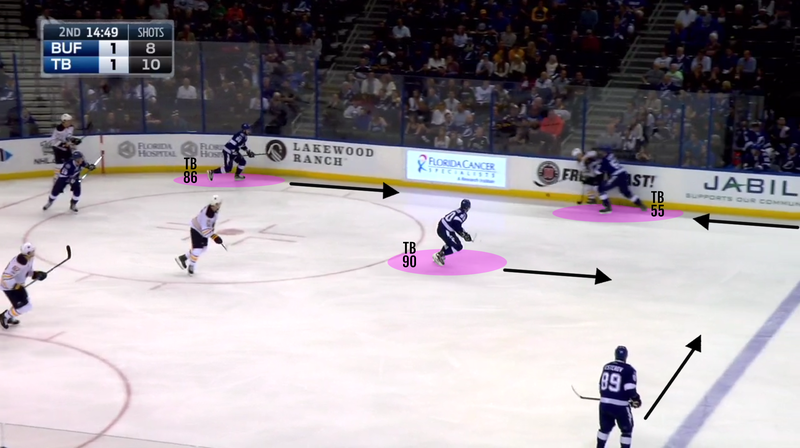 TBL90 immediately supports TBL55 and fills space behind him taking up the traditional defenseman position in the offensive zone. TBL86 also supports TBL55 beating his check out of the corner up the wall. TBL86 picks up loose puck and drives off the wall – low-to-high – in the zone. 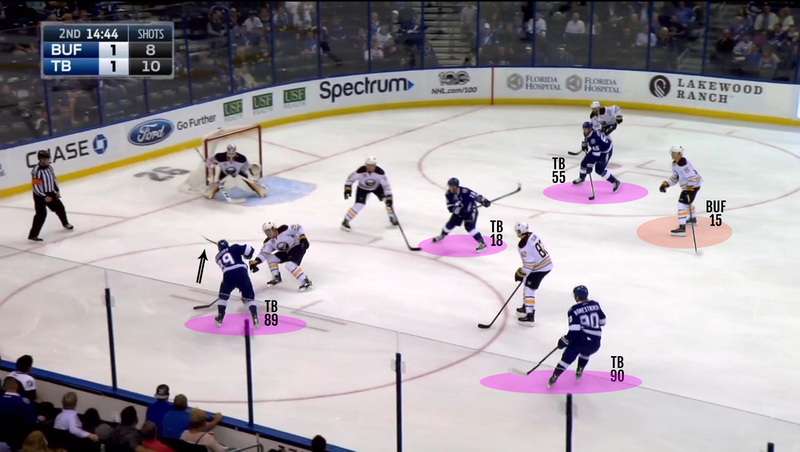 As soon as the puck is retrieved by TBL86 - TBL90 & TBL89 both change from holding the line to attacking the zone. TBL18 immediately sets up as net-front screen/low-tip option. TBL86 continues to skate high into the zone. 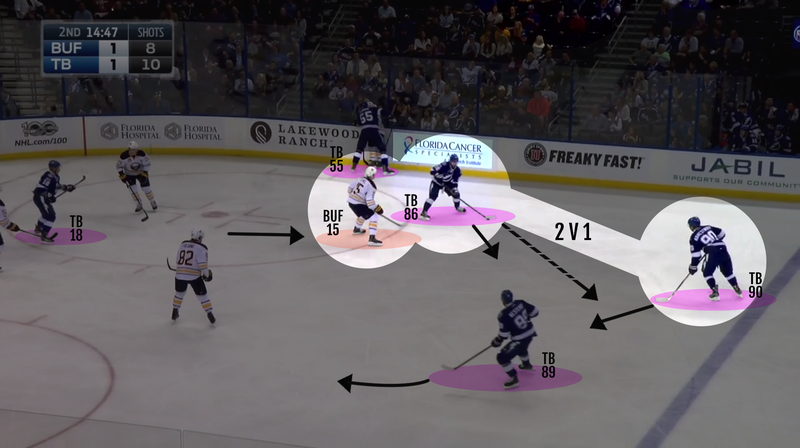 This starts a rotation of TBL players which force BUF defenders to get pulled out of out of position and start chasing the puck. TBL90 slides to the middle and TBL89 shifts down. TBL has created two different high 2v1’s - TB86 & TB90 and TB90 & TB89 - as soon as TB86 moves puck he stays ready for a one timer option back from TB90. TBL55 who pinched down the boards beats his check back to the middle of the ice and TBL effectively has established a 5v4 situation. This creates a series of mismatches. TBL90 establishes himself as a shooting threat at the middle of the ice and BUF82 moves to fill the shooting lane. 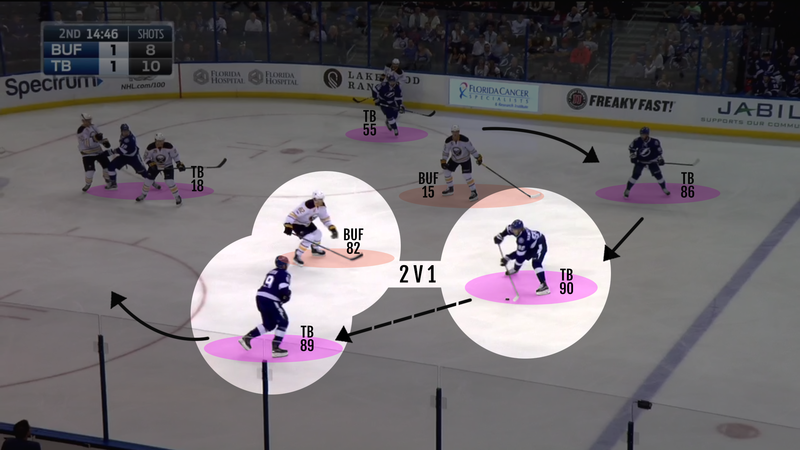 TBL90 identifies the 2v1 and moves the puck to TBL89 who has continued to rotate, sliding down into zone. 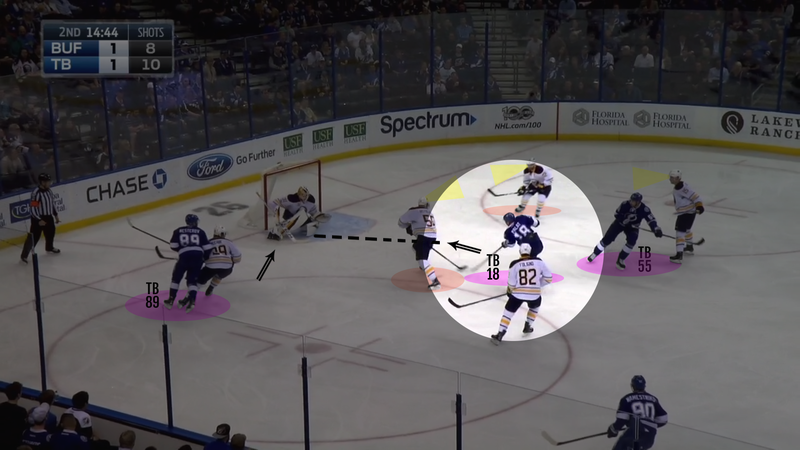 TBL89 with time and space is now a dual threat – shoot on net, Royal Road pass to TBL55 or net front to TBL18. BUF 82 & BUF15 are now high in the zone opening up passing lanes between them and the net-front D-man. TBL18 who was set up as a net-front, low screen, now pops out to slot creating separation from defender as TB89 gets below tops of circles – he doesn’t stay as stationary screen. TBL89 pulls BUF29 from net front but he is too late and TBL89 elects to shoot on net. BUF31 makes the save but note the shot placement. The shot is low, off the far pad which essentially becomes and in-direct pass to TBL18 in the slot. The shot and rebound causes BUF55 to turn and he loses contact with BUF18. TBL18 one-times the rebound into the net. 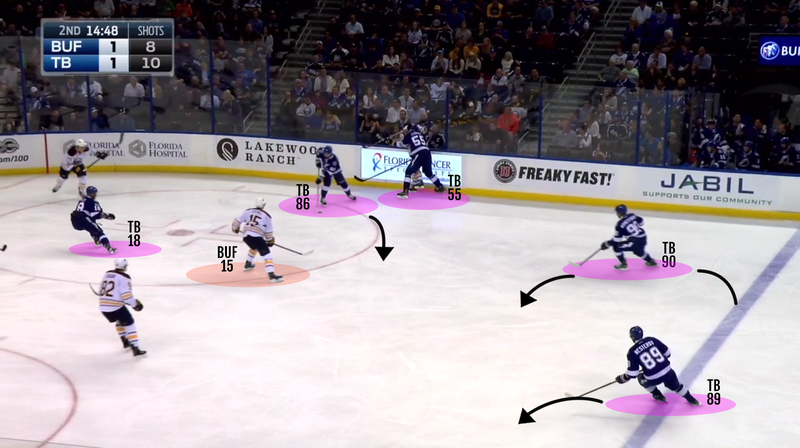 Watch the video again to see how TBL create confusion and mismatches from a simple turn-over and how their players immediately read, support, fill space and provide options executing a great example of TOTAL Hockey.